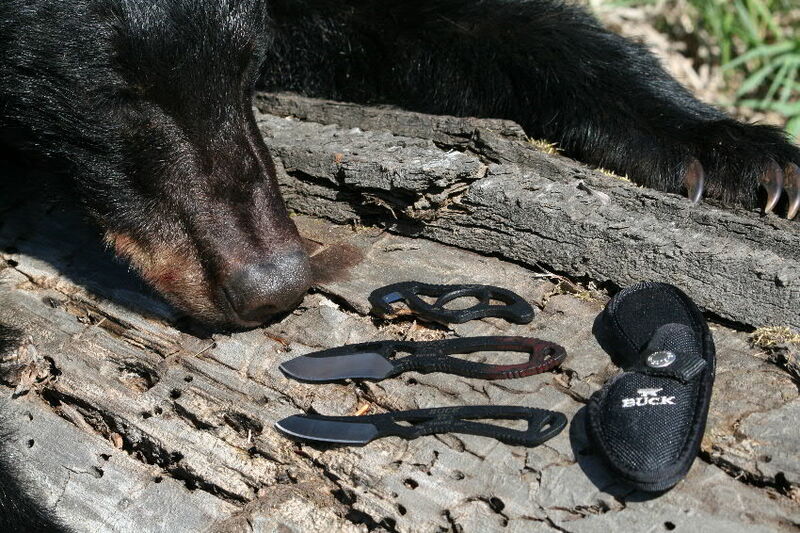 Buck's new PakLite knives include the Gut Hook (top), Skinner and Cape knife (bottom). These are well designed American-made knives using top-quality steels. Buck’s new line of skeletal knives in the PakLite series, represent the highest evolution of this class of utility knives. They are made of the same high-quality steel as used in some of Buck’s other knives, the handle design is the result of extensive product testing by focus groups, and the blades are hollow ground to provide a very sharp cutting edge. The points on these knives are obtuse to prevent hide puncture while providing sufficient “prick” to do delicate work around horns and on other parts of the cape. The gut hook has a prominent finger hole for applying real pressure to a thick hide. The edge of the skinner has a slight upwards turn towards the grip to allow easier hide cutting. Two video clips on the knives appear below. A “Guerrilla Ad” with different content that was filmed at the same time is posted on YouTube at http://www.youtube.com/watch?v=drEw1kTr4-c&layer_token=5008701e4adb15ff. I was able to skin out an average-sized Idaho black bear using the skinner and gut hook without resharpening the blade. These are sophisticated, inexpensive and American-made knives that I am pleased to recommend to Backyard Deer Hunters. Products furnished by the manufacturer. I fear that I cannot give you a pat answer. Very often the question becomes, “How much you got?” This blog is for those who don’t have much money and must get maximum useable value out of what they expend. My book advocates using much that you already have, making some of what you don’t have, paying money for the least expensive really workable item of its class and shaving wrapping and game processing expenses. Depending on what you can adapt, find, recover or borrow; resident deer hunting can be comparatively inexpensive. My book gives some solid tips on how to do this and what exactly you will need. I am glad to watch this you tube video at this web site, therefore right now I am also going to add all my video tutorials at YouTube site. Whenever hide cutting gets easier, count me in! Thanks for sharing.